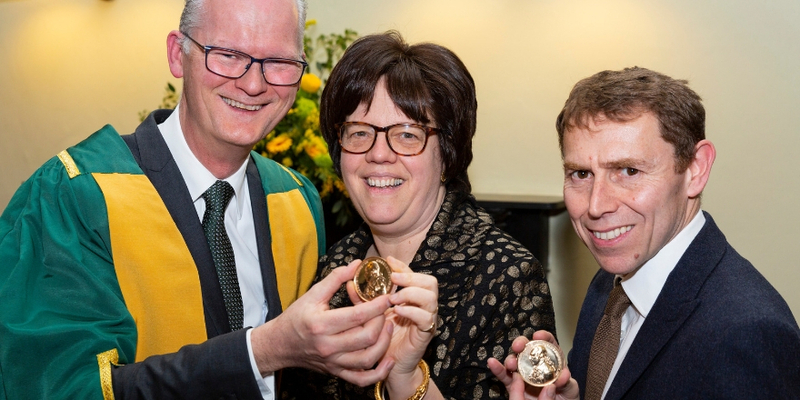 Academy Gold Medals awarded in the Humanities and the Physical and Mathematical Sciences to architectural historian, Professor Kathleen James-Chakraborty and Astrophysicist, Professor Stephen J. Smartt MRIA. On Tuesday 12 February 2018 Joe McHugh, TD, Minister for Education and Skills presented the Royal Irish Academy Gold Medals to architectural historian, Professor Kathleen James-Chakraborty MRIA (UCD) and Astrophysicist, Professor Stephen J. Smartt MRIA (QUB) at a ceremony in Academy House this evening. The medals, sponsored by the Higher Education Authority, celebrate the achievements of inspirational figures in higher education in Ireland and acknowledge the global impact of their work. The Gold Medals are considered the highest accolade in scholarly achievement in Ireland. ‘the Royal Irish Academy Gold Medals recognise world leaders in their research fields. Ireland should be very proud of the outstanding research that takes place in Ireland north and south’. In 2018 the Academy will award two Gold Medals: one in the Humanities and one in the Physical and Mathematical Sciences.